I've still got one arm in plaster so progress has been a little slow. This post will be about the wheelhouse interior but I've also worked on the transom door and opening. I noticed looking at photos of the full size boat that the ends of the top edge are a different shape to what's shown on the kit and the RNLI plans. But that's for another post. I've also been working on the cabin. 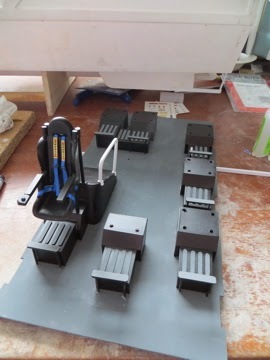 The floor and seat bases are painted and I've added some scratch built foot rests. 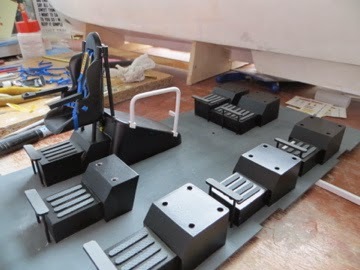 I've also fitted the non slip plates to the front of each seat base (though I lost one so need to add that). I've also been working on the seat belts. 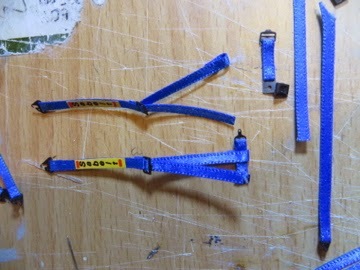 They're made from 3mm ribbon and the hardware is from MFH and Fujimi etched sets for cars. 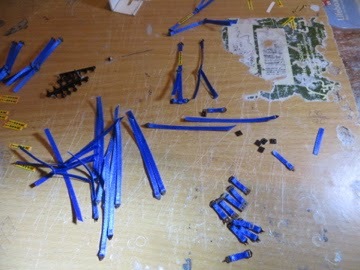 Each set is made up from several 'components as shown below.